How do I install a display language? 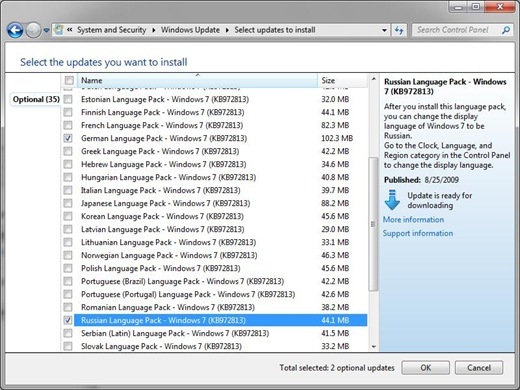 In the next dialog click Install display languages. The next window asks you to chose the method of installation. Click Launch Windows Update. Note the line about optional updates. In the illustration here it says “35 optional updates are available”. It may be different on your computer. Click that phrase. You will be offered a choice of Language Packs. You can chose more than one Language Pack. Click to select. The click OK. The download and installation process may take a long time. When the process finishes your Language Pack or Packs are installed. You may wish to configure your keyboard or the On-Screen Keyboard. For instruction on that, see: How do I change the On-Screen Keyboard from one language to another?